touched by a little bit of Christmas magic. silver and gold and shiny ornaments. I love decking the halls and look forward to the Christmas season all year. setting them up and decorating them. to bring Christmas cheer through the house and cottage. It might be just a little cottage but it isn't small on character. beaded board walls and painted floors it has a very vintage cottage feeling. and not perfectly straight walls. Originally built sometime around 1940 ~ it is filled with vintage charm. and I have many more details and views to share so they will each be in separate posts. the living room is my favorite space in the cottage. with both of my sons helping to build them. 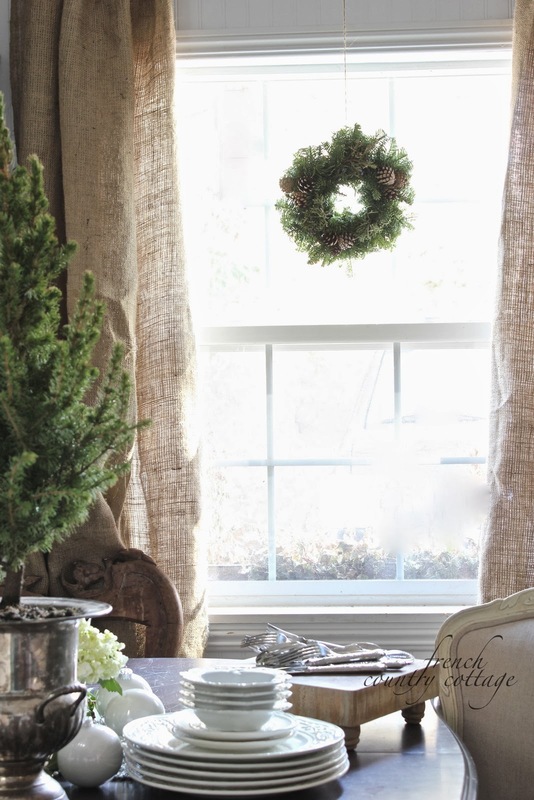 and a simple fresh wreath hangs on the mirror. as well as simple whites this year. Since they share a room, I don't add too much so as not to overload the space. They are both added for a few photos for something special so these areas will be changing. In love with this antique painted bed all dressed in white linens and ready for guests. a little tour of the little cottage with a touch of Christmas. It is getting it's holiday on and will be ready soon. The cottage is perfect. There is nothing better than fresh greens. Happy Holidays. ABsolutely gorgeous, Courtney! 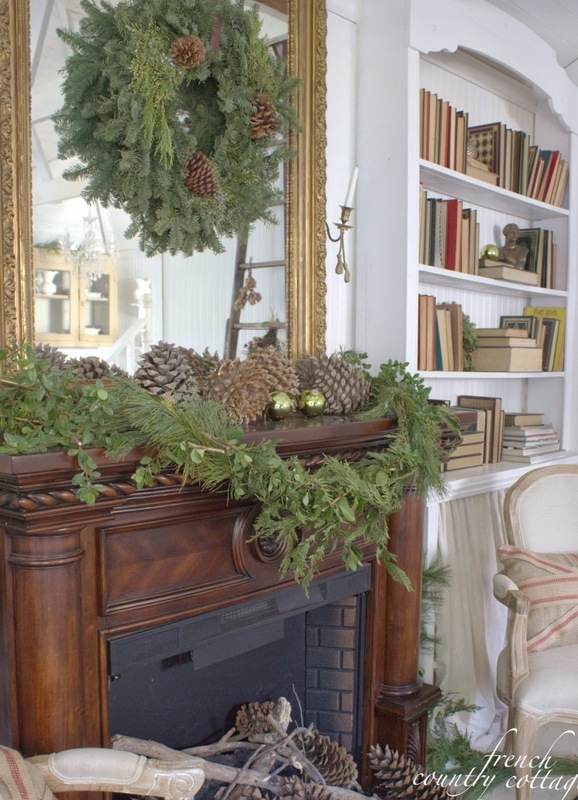 I love your lush garlands and beautiful embellishments … your holiday guests of the cottage WON'T want to leave !! Beautiful, Courtney. Love that rocking horse. It's beautiful, Courtney. Absolutely love the little cottage! Just beautiful, Courtney! I don't know which I love more ... your home or your little cottage! Gorgeous Courtney...I love it all!! I love the simple and natural touches, Courtney! All the greenery looks great and very classic. Oh, wow Courtney it is SO SO gorgeous! 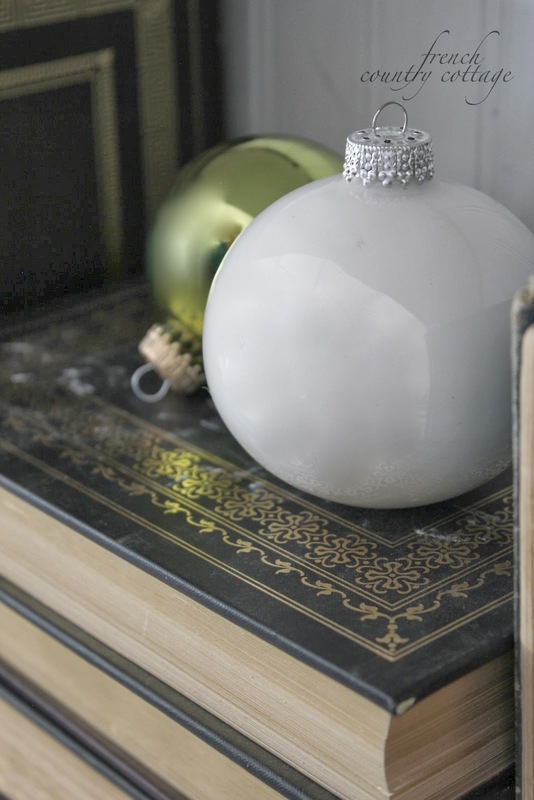 You do such a great job with Christmas in your French country style. Love all the details!! Wow Courtney, it's all just beautiful. I love how you use all the fresh greens and your Christmas decor is always so gorgeous. Love love it all!! Beautiful! I love wreaths and natural decorating. Happy new week! Wow, I have no words! Every detail is stunning. That rocking horse is just awesome. If this is your guest house, I can imagine how gorgeous the main house is! Thanks for sharing & Merry Christmas! Your home is just gorgeous all dressed up for Christmas! Those are some of the biggest pine cones I've ever seen. Your decorating is just so pretty! Hope you're doing well. This is truly like something from a magazine. I love the fireplace most of all - looks like a perfect space to cozy up with a mug of hot chocolate and a book. This is simply gorgeous. That fireplace is positively dreamy. I just wanna grab a cup of hot cocoa and settle in there. Love all your simple touches in this adorable little cottage of yours. You've really got me in the mood and looks like i better get a move on since most of blogland is decorated for Christmas already! What a wonderful little space this is! I love all your greenery. All the photos are just dreamy. Wow your home is stunning! I feel like I walked into the perfect Christmas magazine you did an incredible job Love every photo you have shared! Beautiful! 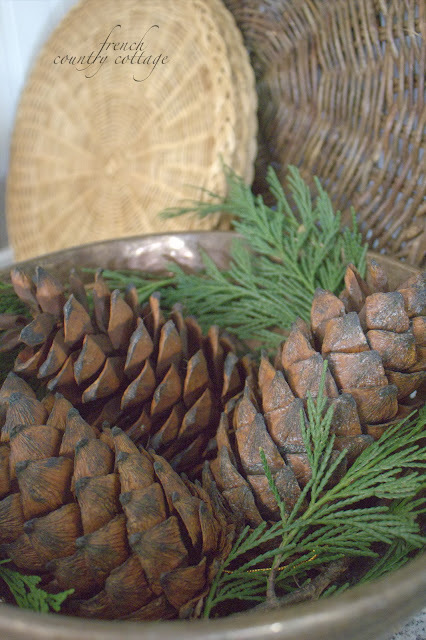 I love all the natural elements and using everyday items in your holiday decorations. Merci pour toutes vos merveilleuses photos. Absolutely lovely. Every detail is beautiful! Everything is just perfect! 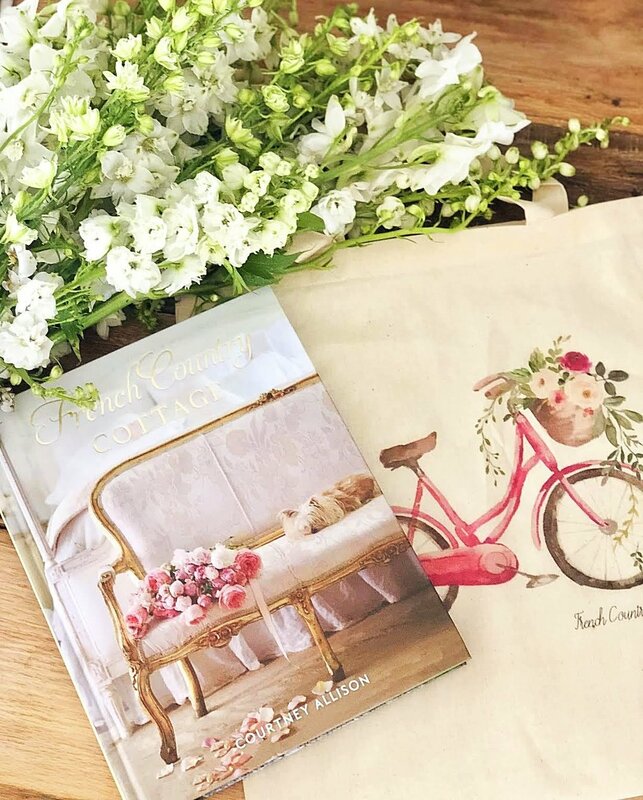 Love your photos and decor ~ as pretty as a dreamy Christmas magazine. Thanks for sharing your lovely cottage. so so beautiful!!! i love the fresh greenery! Gorgeous!!!! 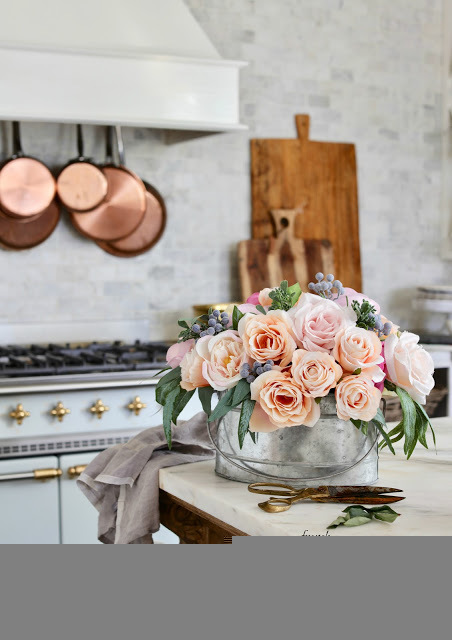 Love it all Courtney and I am always amazed at how flawless your natural decor is. Everything is beautiful and this is so awe-inspiring. LOVE LOVE LOVE IT!! 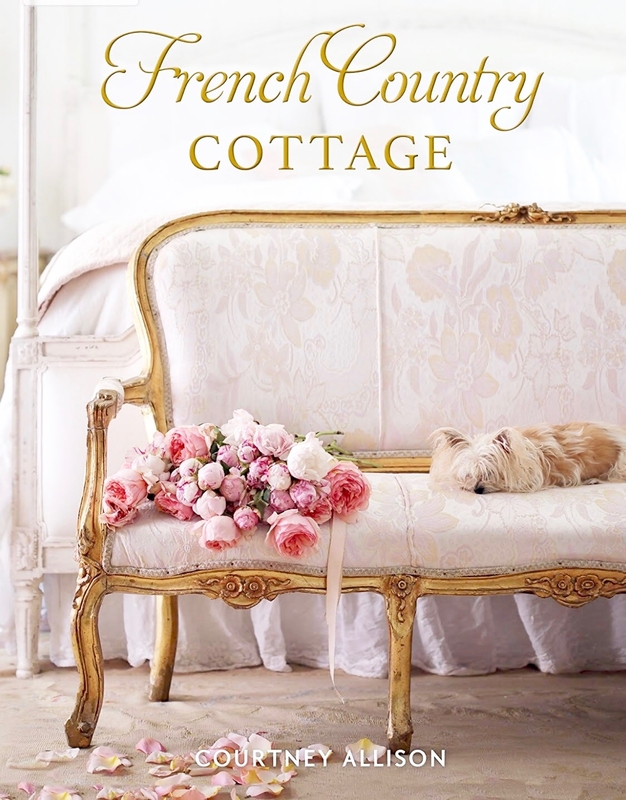 Courtney, your cottage is just dreamy! I love how you've used the tiny living trees in several of your rooms. I've always adored this little guest cottage Courtney and she's even more adorable dressed up for Christmas. Thank you for sharing her beauty on the Home for the Holidays tour. bellissime le tue decorazioni Natalizie! Just beautiful! Sharing on FB right now! Gorgeous as always! I love all the greenery combined with the soft neutrals...so peaceful and serene! Oh my gahhhhhhh..... I don't even have words, Courtney. Seriously, no words for how stunning all of this is! I'm amazed. Wow!!!!! Pinning every single photo when I get a chance! So gorgeous, really. Your attention to detail is incredible, as is your photography. I would LOVE to be a guest there!! Merry Christmas season! Beautiful, Courtney!! Love the rocking horse with the garland. I bet the aroma from all of the greens is intoxicating. 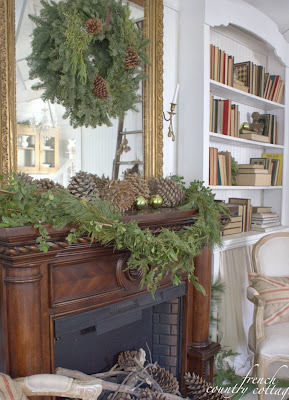 Your cottage is a Christmas dream - I love all the wreaths and especially the vintage skates! Beautiful House Tour Courtney! I loved seeing every lovely detail you added! I decorate with pinecones too! 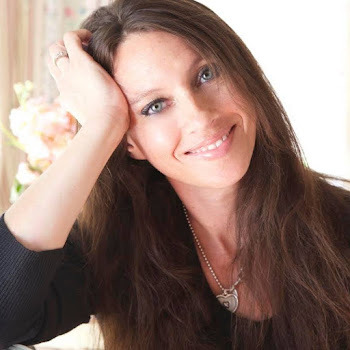 Thanks for sharing your gorgeous home!! I'd love to wrap up in that cozy white throw and take a little nap on that bed! Your cottage is just adorable, Courtney! Loving all of the natural elements that you used. There isn't any way that I can pick a fave cause I love it all! Just Stunning Courtney. I love it all. Gorgeous! Every inch! What are the green clusters on your counter? Sheer perfection....that's just what you do! I really like the pillow how it's designed, great idea's! Thank you. I love your mantel. Can you tell me where you purchased it or did it come with the house? I am currently in search of a mantel for our home expansion. Thanks for any help you can give! Courtney, can you tell me where you purchased your mantel or did it come with the house? I am in search of a mantel and yours is beautiful! Thanks for any help you can give. It came from either Lowe's or Costco. I am pretty sure it was Lowe's though. Hope that helps! Thanks for responding! Is it an electric fireplace with attached mantel or just a mantel?